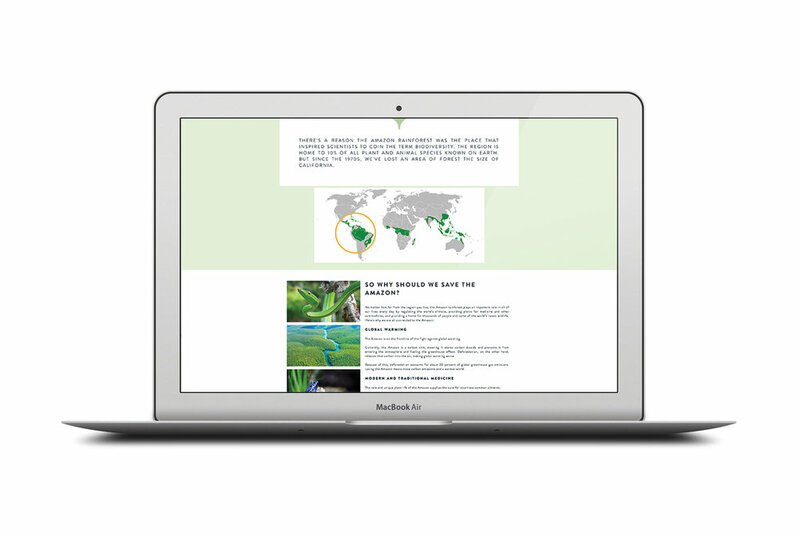 Brief / Description: This was a project in which I created a fictional brand and call-to-action called the Rainforest Protection Fund (RPF). The campaign needed to include a logo design with variations, a functional website, and an application design. RPF is a fictional organization whose purpose is to help protect and preserve the remaining rainforests in the world, as well as the wildlife and animals living in them that are facing the threat of extinction due to deforestation and climate change. RPF aims to achieve this by educating the public to take action and make a difference. I designed RPF to educate and inform the public primarily through the use of their website and mobile app. The website contains information regarding the three major remaining rainforests; the animals, wildlife, and indigenous population inhabiting the rainforests; the threats that are causing the rainforests to diminish drastically and harm them (such as human interference, deforestation, and climate change); solutions to help protect and preserve our rainforests; and how to help take action against the major problems threatening our remaining rainforests and the wildlife within them.